Yup--I know it is a heavy burden, but I can still participate. I'm still in, though should I fail to respond to a summons, someone should poke me on FB in case I don't get my PM notification. Very well. I will send out the first sentence today. General rule of thumb: if it's your turn to write a sentence, please do so within a day, if you are supposed to draw a picture, please do so within three days. I will keep poking you if you don't. Of course, if someone still appears before the first round is done and wants to join, we can do some last-minute mixing up. Same if you feel the need to switch places for any reason, please just say so, and we can do it. Last edited by Legate of Amon Lanc; 05-12-2018 at 04:38 AM. I have just ordered a new battery for my laptop. If installation goes well, I should be able to use my laptop to its potential and mod the next game. In any case, I just sent my sentence off! ...aand in any case, with that, we are nearly halfway through. I can tell you, so far it's been a very interesting round. Very well everyone, we are getting really, really close! A few more days, and you can all see what we have... eh... created. Legate sent me the sentence to draw a few days ago and I completely forgot about it! So sorry, guys! I'm drawing my picture tonight. Oh my goodness! I'm so excited for this! This Paper Telephone is going to make my exam studying a lot less studious. All right, the time has come! Friends, 'Downers, dear guests. You don't understand, do you. Neither do I, despite having seen it all. But let's start from the beginning and go through it all, step by step. Buckle up, we are just about to start the ride. Last edited by Legate of Amon Lanc; 05-12-2018 at 04:54 AM. So once again - as mentioned above, we started with the traditional piece of poetry from Bilbo Baggins's collection. but still they cannot find me!" 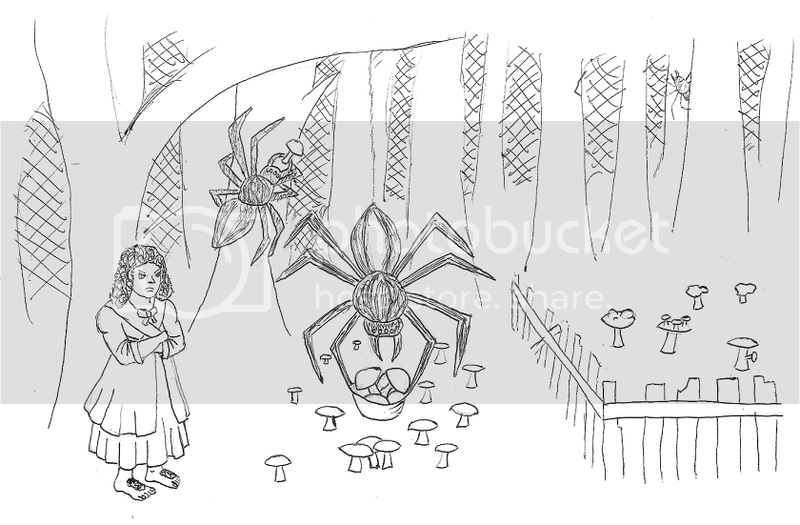 Lobelia's experiment with genetically modified corn greatly improved productivity among the Mirkwood spiders, though some of her other work was considered error-prone. There isn't mushroom for error when you garden under the direction of Little Miss Muffoot. 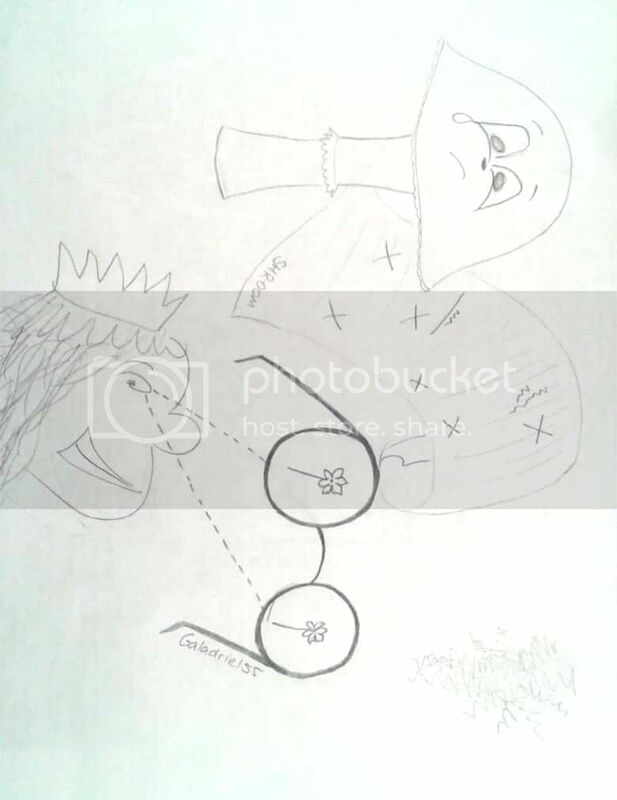 The mushroom's errors loomed over the Princess's ability to see flowers. 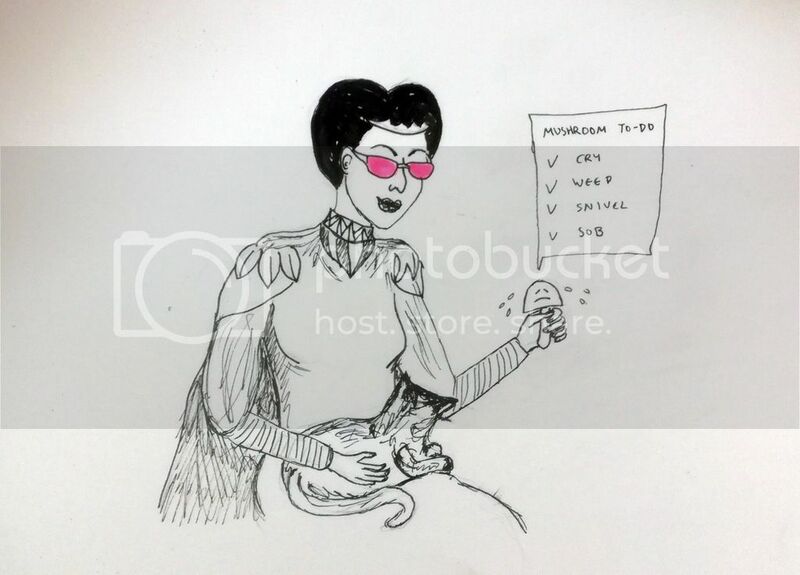 The Queen looks through rose-tinted glasses at a crying mushroom with a list. Queen Beruthiel was wont to idealise the suffering of the fungoid masses. Seven out of ten cats agree: Queen Beruthiel's scheme to barricade the mines with fungi was a masterstroke of bioengineering. 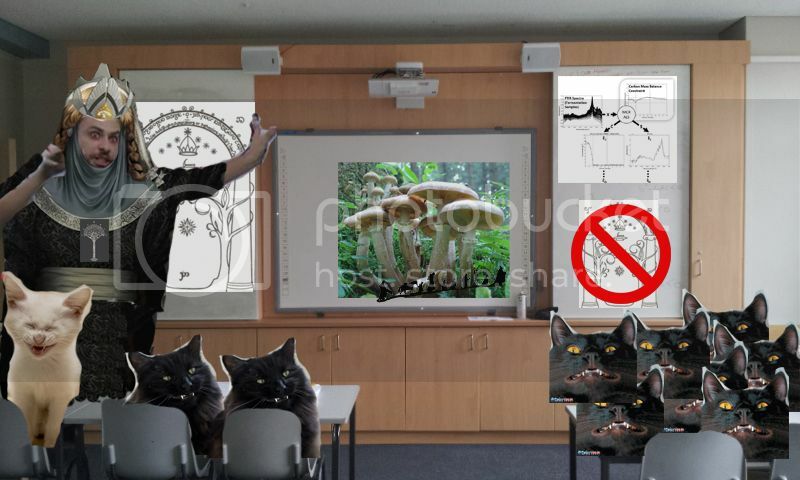 The all-feline audience listened attentively to the presentation by The White Tree Society regarding the mission to take the ring to Mount Shroom. 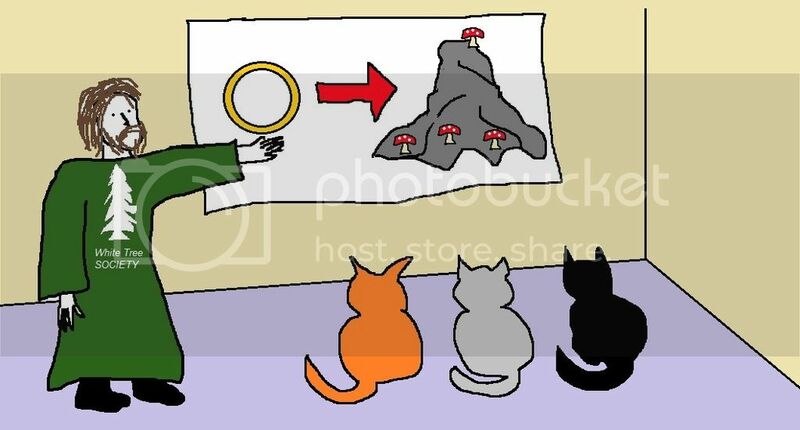 Having failed botany class, Faramir decided to go into animal training, planning to teach cats to carry the Ring to Orodruin using the local flora for orientation. 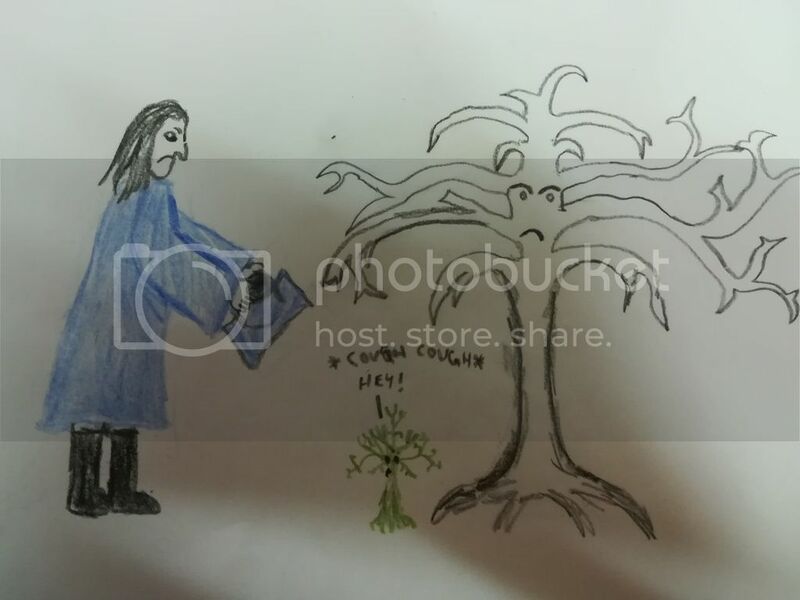 Faramir's dreams about an academic career in botany may have been crushed, but it didn't mean he couldn't do something with plants when he grew up. Thank you for the ride, everyone - it's been a mad one. I cannot express how much fun it's been to mod this, and see all your creations. You're all crazy cobs, and that's a compliment!!! I had forgotten what fun Paper Telephone is. Thanks, everyone - but especially Oddwen. I can finally make sense of the night a while back when Legate kept having hysterical laughing fits at 1am because "Oddwen's paper telephone picture". That picture is amazing. ^I absolutely second this. You win PT, Oddwen! Rune - kudos for managing to translate my pictorial mess into something intelligible! Huey - love your picture! So this is where the mushrooms came from. Oddwen - 'mushroom for error' = pure genius! sally - the expression of your Little Miss Muffoot! Somehow she reminds me of Dolores Umbridge. Formy - I wonder whether the princess's eyesight was impaired by consuming the wrong mushroom? From there on things took a turn towards rabid insanity. Mount Shroom! TGEW's cats look so unhappy, they seem to have an inkling that their quest is doomed, as evidenced by their not surviving into Lommy 's sentence. And I trust I won't be the first to have noticed that Legate's Faramir looks a lot like a self portrait. Thank you so much for modding this! I loved your Queen Berúthiel! 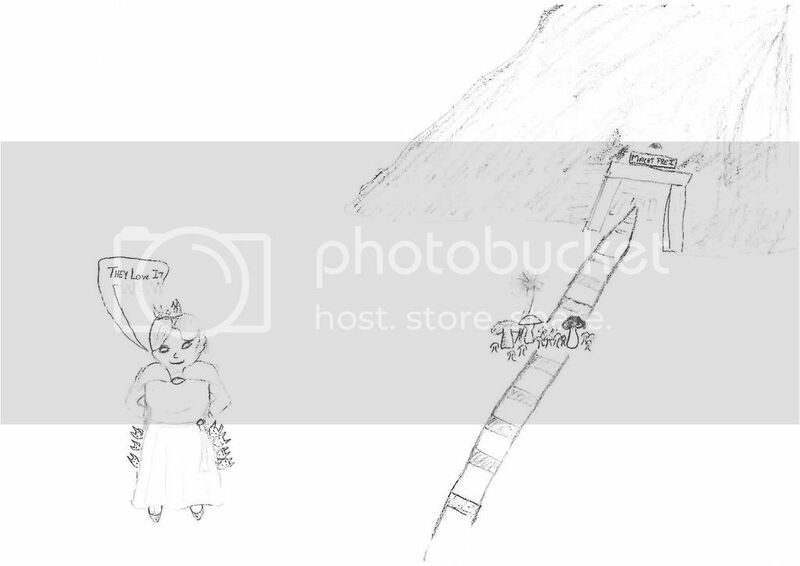 (This was my first glimpse of what had come of my picture, and I remember commenting to Legate that 'woman + food seem to have been the most tenacious elements'. Indeed. When I saw the picture on the second round, my first thought was that the only thing to make it through was the shrooms. It was a great round! Thanks Legate for modding and marshaling us into a fast-paced schedule! The picture at the end was a fun idea too. 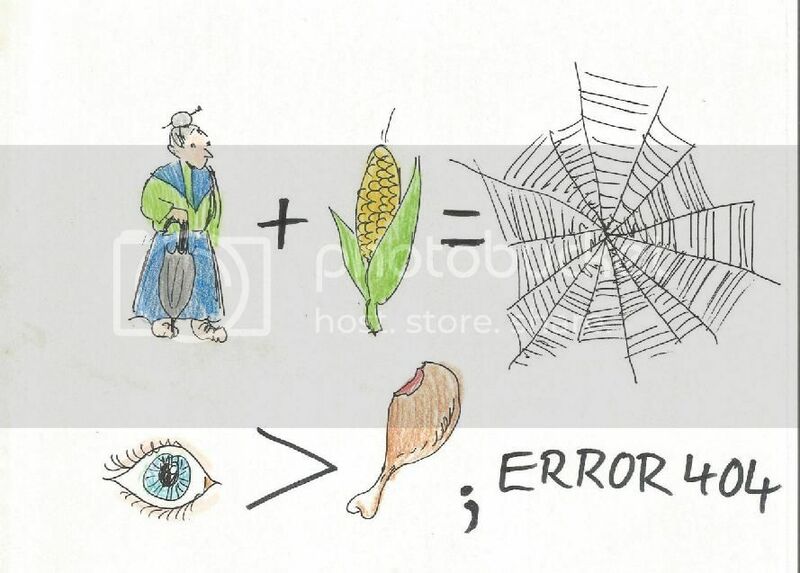 I love Pitch's somewhat rebus-like picture. 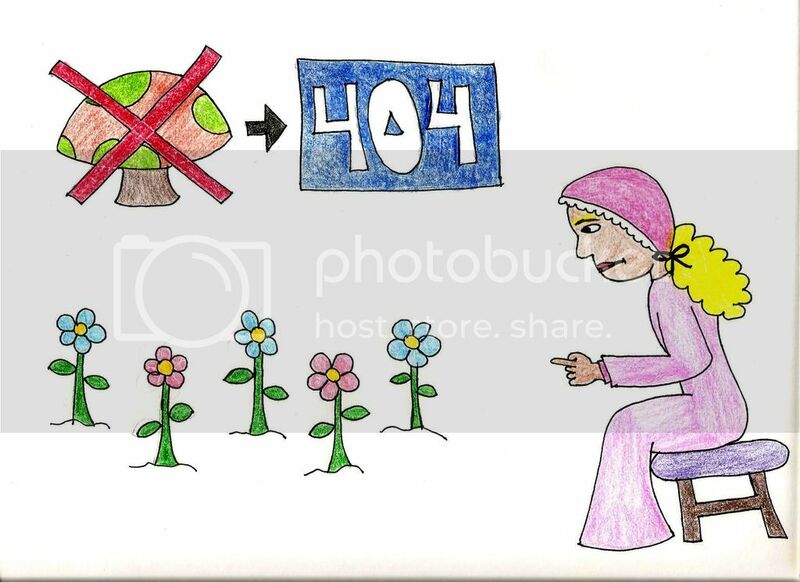 It's funny that 404 came up again - I thought it was hilarious! HS, you're quite the artist. And Oddwen's setence right after - I mustache you where that idea came from, it's a stroke of genius. Lommy's Beruthiel looks so realistically smug. It's creepy. And in Legate's last picture the White Tree looks so sternly disapproving. It must know the Ents will not let this business continue. And I trust I won't be the first to have noticed that Legate's Faramir looks a lot like a self portrait. Thank you so much for modding this! Nah, Faramir looks too frowny. But second the last sentence! Oddwen's picture made me laugh out loud. All in all, a very enjoyable round. Since I didn't mod for it, I'm game for modding this time around! I am up for participating in another round. I love the puns! Especial shoutout to Oddwen for Little Miss Muffoot and sally for Mount Shroom. I'm amused (and bewildered) that two separate people included a 404 error in their pictures, and I am in awe of Lommy's Queen (is she meant to be Beruthiel?). Nah, Faramir looks too frowny. Have you ever seen Legate make faces? He's beautiful! The black and ginger ones remind me of my Mom's cats, Guinness and Idris (both named after common beverages of the British Isles). Since I didn't mod for it, I'm game for modding this time around! We'll hold you to that! I'm obviously in for another round, too. This was a wild ride indeed! 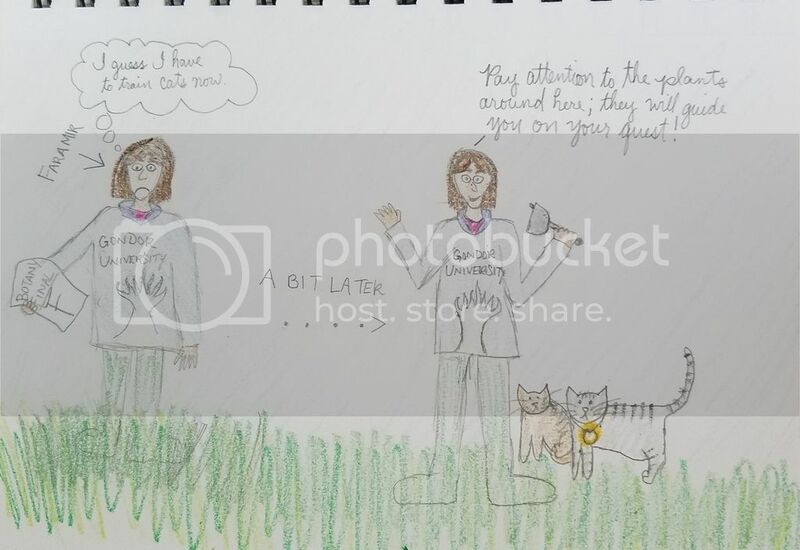 I especially enjoyed Lommy's rose-colored glasses and poor Form's interpretation of my ridiculous scribbling. Cheers and huzzahs to everyone on a hilarious game. I am of course up for another round of this craziness. Okay, I'm super bad because I'm never on the Downs anymore, but I'm still down to mod. I think we might have to do a bit of campaigning to get participants.